Gardens, cuisine, and an open air bath. A relaxing stay for each individual guest. 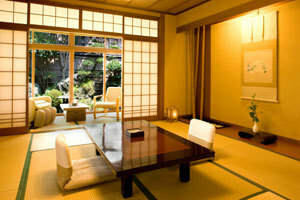 Many have come back to stay at this hot spring inn. Our most standard rooms facing out onto the central courtyard. 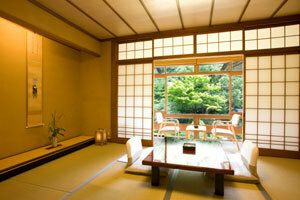 With an area of 13 square meters the room can hold up to 4 guests. Comes with its own full bathroom, including bidet. 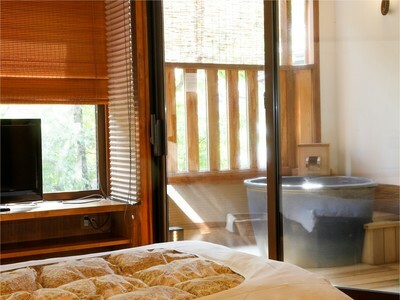 Guest room is complete with an open-air bath for the guests' own private use. Unlike the public open-air baths in the town and the inn's large public bath, here you can enjoy your own private bath at your own leisure. 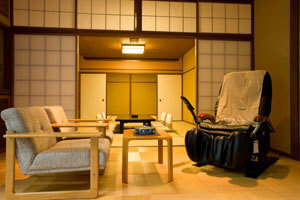 The room's 13 sq.m. of space can hold up to 4 guests. Room has it's own bidet restroom. The room's 13sq.m can hold up to 4 guests。The rooms spacious area, almost twice of the regular rooms, gives a villa feeling in this special room. 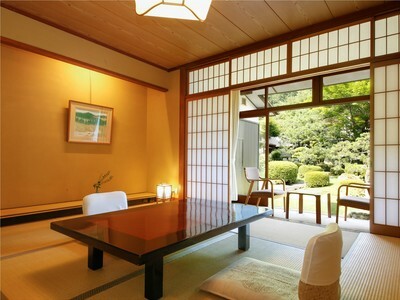 This calm and spacious room is about 25 sq.m. including two conjoining rooms and a massage chair.